Masonry heaters generally weight between 2,000 and 10,000 lbs and can be installed in virtually any home. It may take some creativity when retrofitting an existing floor system to carry the weight of your new masonry heater, but we can assist your local contractor, engineer or architect in finding good solution for your masonry heater foundation. When designing a new home, creating a foundation for a masonry heater is a simple part of the engineering process. Crawlspaces are usually less than 5 feet high. A general recommendation that we can provide is a foundation in the form of a steel-reinforced solid concrete block which can also serve as a support to hang floor joists. As floor joists must not come in contact with concrete, pressure-treated wood should be placed between the joists and the concrete. When a masonry heaters is installed in a house with a slab on grade foundation, check that the slab is at least 4 “ steel reinforced, vibrated concrete as used for garage floors. Generally the load carrying capacity should be adequate, but you must check with your locally licensed engineer. A cinder block foundation, set on concrete footings is often a good solution for a home with a full basement. The cinder block walls often can be used as a gun safe or other storage at the basement level. A concrete cap is usually poured to align with the finished floor height on the main level of the home. 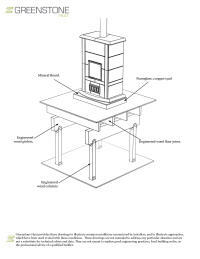 Your masonry heater will then set on this concrete cap slab.For all buildings, the masonry heater foundation should be designed by a licensed contractor, architect or structural engineer, in accordance with the local building code. * When soliciting an estimate from your local contractor for building the foundation, request a drawing with the structural details of the foundation. The building code requires a non-combustible floor in the hearth area (spark protection zone in front of the firebox). Please check with your building department. 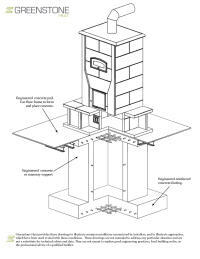 ASTM E 1602-94 recommends 16” depth in front of the firebox and a width that extends 8” on each side of the firebox. Most people use soapstone tiles in this spark protection area. 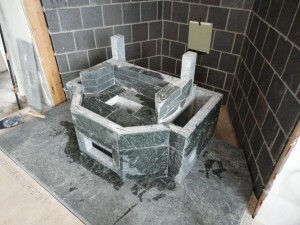 If you prefer that the tiles fit under the base trim of the soapstone heater, its foundation must be raised by the thickness of the tiles and mortar, plus 1/16”. Rip some lumber to the exact width by which you are rising the soapstone heater foundation. Frame the footprint, line it with chicken wire and then pour the mortar. Screed it off across the frame. Some slight cracking on the cement can occur but this is not harmful.It is not a good idea to pour the concrete of the foundation higher than the plywood sub-floor. It will be extremely difficult to remove the excess if the heater is subsequently removed for any reason. In the area of the heated bench the foundation can also be raised by insulating the plywood sub-floor with and mineral board Foamglas. 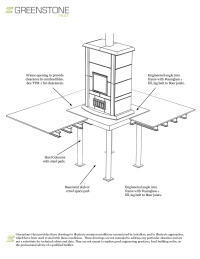 Please call Greenstone Heat today and one of our designers can assist you in understanding the masonry heater foundation design requirements and process.